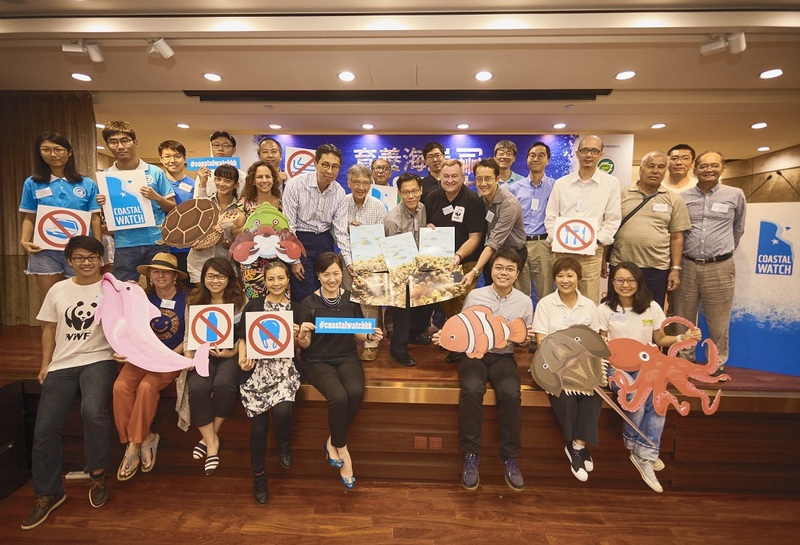 In June 2014, WWF-Hong Kong launched the ground-breaking Coastal Watch project. The aim of this two-year project was to continue the public engagement and active momentum which began after the plastic pellet spill disaster of August 2012. The project achieved this goal in a number of ways: through cleaning up several coastal sites across Hong Kong and by performing marine litter and ecological surveys to trace the source of marine litter. Ultimately, the survey data will help the government formulate effective long-term solutions to our persistent marine litter problem. Now, two years later, the wildly successful Coastal Watch project has finished performing all its coastline, coastal waters and underwater ecological and marine litter surveys. Today, 8 October, we held the second year’s awards ceremony at which we thanked the project’s volunteers for all their enthusiasm and effort. The final year’s preliminary surveys results were also announced. With the surveys covering 34 project sites of high conservation value, the results showed that plastic litter is present in all Hong Kong coastal habitats. Plastic was the major component of the litter found at every site – ranging from 60 to 80 per cent of the litter collected. As the Coastal Watch project draws to a close, we are encouraging everyone in Hong Kong to support our “Knock Plastic Out of the Ocean” campaign by pledging to reduce their use of disposable plastic products. We are also working to foster long-lasting cross-border collaboration between NGOs in Hong Kong, mainland China and Macau, aiming to jointly face up marine litter problem through regional and cross-sectoral efforts. At the ceremony, the Coastal Watch project was honoured to welcome several high-profile officiating guests: Mr Donald Tong, JP, Permanent Secretary for the Environment / Director of Environmental Protection; Mr Cary Chan, Chairman of the Environmental Education and Community Action Projects Vetting Sub-Committee of the Environment and Conservation Fund; Mr Patrick Lai, Assistant Director (Country and Marine Parks) of the Agriculture, Fisheries and Conservation Department; Mr Chan Chung-chi, Assistant Director (Operations) (Acting) of the Food and Environmental Hygiene Department; and Mr Peter Cornthwaite, Chief Executive Officer of WWF-Hong Kong. Our officiating guests were joined by honoured guests from our six strategic partners – Eco Marine, Ecovision’s Hong Kong Cleanup, Green Council, Eco-Education and Resources Centre, Ocean Park Conservation Foundation Hong Kong and Plastic Free Seas, in addition to Coastal Watch’s team scientists and volunteers, and representatives from the fishing community and NGOs from mainland China. Together, we all celebrated the incredible achievements and positive outcomes of the Coastal Watch project. Over the two years of Coastal Watch, more than 2,000 volunteers and representatives of fishing groups from three districts conducted marine litter and ecological surveys at 34 coastal sites of unique ecological value, including mangroves, mudflats, sandy beaches, rocky shores and coral communities, conducting a total of 130 sites actions (please refer to the Appendix for further details). The survey data from the project’s second year was collected between July 2015 and July 2016. The preliminary survey results (calculated from the number of pieces of litter collected) showed that plastic made up, on average more than 60 per cent of the marine litter collected.In our land-based surveys, which included mangrove, mudflat, sandy beach and rocky shore habitats, the proportion of macro-debris plastic was nearly 65 per cent (64.6%). Of the floating littercollected in collaboration with fishing groups, the proportion of plastic exceeded 80 per cent (83.7%). Lastly, in Hong Kong’sunderwater environments, sites which are usually not widely investigated, plastic debris was also the most common type of litter, comprising around 65 per cent (65.5%) of the total litter found. Apart from the marine litter and ecological surveys, Coastal Watch also organized various public activities over the two years: the Ocean Seminar Series and a Lap Sap Wan survey and clean up event being the most high profile. This year, we also published an education leaflet; and not long ago we organized the first-ever Cross-Border Coastal Clean-up activity, teaming up with passionate NGOs from Hong Kong, Macau and mainland China to kick-start a joint effort to face up marine litter problem. Our latest public engagement campaign is our “Knock Plastic Out of the Ocean” pledge, designed to increase public awareness of the importance of reducing the use of single-use plastic items. In Hong Kong, the implementation of policies related to single-use plastic products is still stuck in the start-up phase. The only policy being fully implemented at the moment is the plastic shopping bag charge. To help create more awareness and catalyse the search for solutions, Coastal Watch recently launched our “Knock Plastic out of the Ocean” campaign, aiming to collect signatures from citizens and organizations. The ultimate aims of the campaign are to urge the government to introduce a producer responsibility scheme for single-use plastic products; and to encourage the business sector to uphold their responsibilities by using environmentally-friendly alternatives to plastic and implementing the 3Rs – reduce, reuse and recycle – for their products. We are also encouraging people and companies across Hong Kong to pledge to say “no” to single-use plastic and to change their consumption habits through a promise to reduce their use of five single-use plastic items: plastic bags, plastic cutlery, polystyrene meal boxes, straws and bottled water. So far, we have collected more than 5,000 pledges – we invite you to join us and say “no” to disposable plastics and say “yes” to marine life! To find more effective solutions to the regional marine pollution problem, after the Cross-border coastal clean-up activities in June, Coastal Watch proposed several ways to enhance cross-border collaboration between NGOs in Hong Kong, mainland China and Macau. We recommended that the government increase connections between regional governments and regional NGOs. In September, these proposals led to some good news: in view of the enormous amount of floating refuse found in Hong Kong waters this summer, the environmental protection authorities in Guangdong and Hong Kong agreed to set up a notification and early warning mechanism. This will hopefully foster future co-operation to protect the marine environment which will allow urgent marine environmental problems, including floating refuse, to be tackled more effectively. Coastal Watch welcomes this mechanism and encourages both governments to continuously exchange information about this problem. However, the key remains tackling this issue at its source. The Coastal Watch team hopes that this mechanism will act as the stepping stone, through which a series of joint measures can be enacted to create positive impacts on our region’s rich and precious marine life. Last but not least, we will announce the full findings of the Coastal Watch marine litter and ecological surveys in a report issued at the end of October, while a public exhibition featuring highlights of the project’s two successful years will also be held at the Hong Kong Maritime Museum.